500ft from the biggest and quietest beach on Lake Champlain and the Ausable River. View of lake from rental room. Kite surfing hot spot, kayaking, paddle boarding, sailing, snorkeling, canoeing, bicycle touring. 4 min drive from the NYC / Montreal train station and Vermont ferry. A lockable private room in a single family house with detached standing shower bathroom and natural latex queen size bed. Breakfast and free taxi to and from ferry and train station included. Passionate about water sports, wildlife, outdoor adventure, racing, cooking, art, fitness, engineering and the world. I would love to share our wonderful location with like-minded guests. It's truly breath taking. We'll let you enjoy the surroundings as you wish or I can give you some of the best guiding, instruction and touring and food available. Unreal beauty and adventure. Access from Montreal, Burlington and New York City with NO car required. Endless activities at you fingertips. High end, memorable breakfast. Top level on-site instruction in many sports. Access to one of the most beautiful and wild areas of Lake Champlain. You will come away with new skills and dreamlike memories. deeded access to a private beach 500 ft down the road...a strip of 190ft deep by 50ft along the water. The entire Ausable River sand delta is open to explore just across the river to the north. FYI, natural latex mattresses cannot harbor bed bugs....and they are the most comfortable mattresses on the market. upon request. Guest may load and unload if they want but we will run the machines. table is in rental room. Canoe included with lessons. 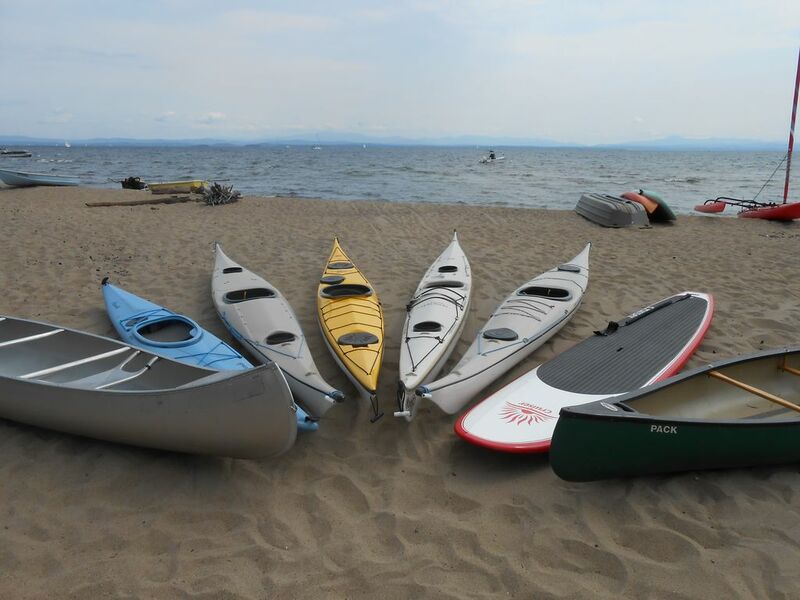 Kayaks, paddle boards, windsurfers, sailboat, available with paid lessons and or guiding. Credit card required for rentals. small sailboat: AMF Puffer, part of extra water sports package. Please inquire. Credit card required for rentals. snorkeling gear included. Credit card required for deposit. A credit card is required for rental deposits. Cash is accepted for lessons and guiding. Canoeing lessons, canoe rescue instruction, and usage are free. RATES: 1 kayak or SUP or windsurfer / day = $50 1 kayak or SUP or windsurfer / hr = $12 1 sailboat / day = $80 3 hr lesson / person = $55 guiding / 2 hrs / group = $60 We have some very high quality equipment which is a thrill to use but also costs more to replace and fix. We also want people to be trained in using the equipment properly not only so that the equipment is maintained but also so that people can better enjoy the adventure and the high quality gear. Sure, you can stay somewhere with cheap equipment and no instruction but we feel that many miss out on the experience this way. With proper instruction and gear, you can have more fun, go faster, farther, more safely, get a better workout, and go in rougher conditions (while actually enjoying it). We hope you agree. I don't do reviews often - too lazy. But this time I had to - Judah, the owner, tried to tend to our every whim. Breakfast for the kings and he followed up with the phone call to see if he can improve on anything after we left. Excellent service. The owner is truly amazing guy and mensch. We had a wonderful time staying with our host, Jude. The room is clean and very comfy as well as the nicely appointed bathroom. The short walk to the beach brought us to a quiet spot on gorgeous Lake Champlain. Jude has many offerings of equipment to enjoy on the beach. He also recommended a great hike. Last but not least the delicious breakfasts he cooks in the mornings! Amiable chats as well. An impeccably clean and very pleasant room in a gorgeous home down the block from the lake, where you can swim, borrow a canoe courtesy of your friendly, accommodating host, Jude (though we did not get around to boating), or just wade in the ample shallow water (as we did) and take in the stunning scenery -- Adirondack forests all around and Green Mountains above the lake in the distance. Jude was happy to share his knowledge of the area and prepared delicious, five-star breakfasts for us on both mornings of our stay. An altogether lovely place! My husband and I were welcomed by Jude and Suzy just like kings. The house is just steps from a private beach. It is also very close to the Ausable Chasm, Valcour, and the area has great restaurants and other attractions. The bedroom has a very comfortable bed, and is separate from the living area which gives all needed privacy. Every breakfast was made by Jude and were absolutely delicious and different every morning. Kayaks, canoes and paddle board are available for a small fee which makes the whole beach experience very special. Most of all, Jude and Suzy were great hosts, we had great chats but they also gave us space for us to do our thing. Overall we had a great stay and will definitely come back! My boyfriend and I spent Columbus Day weekend at Jude's beach house. We enjoyed the delicious breakfasts. We had a fire on the beach under a gorgeous moonrise over Lake Champlain. We also did the Premier Package at Ausable Chasm, which I highly recommend. We got to climb rock faces and cross cable bridges over the beautiful "Grand Canyon of the East." We took the ferry over to Burlington, VT out of Essex (since the Port Kent one was closer for the season). Then we had to take the Grand Isle/Plattsburgh one back since that one was open 24/7. It was a little bit of a hike, but worth it! Jude and his family were very friendly! He was more than willing to let us use his boats, but our busy schedule and some rain didn't afford us the opportunity. We would definitely come back, and we're grateful for the opportunity to stay. Couldn't have asked for more!! My girlfriend and I had a wonderful experience staying at Jude's lakefront property. Not only was the bedroom large and comfortable but Jude and his family were great hosts! They made us a delicious breakfast and provided transportation to the ferry. super scenic road bike routes rolling along Lake Champlain http://cyclingnewengland.blogspot.ca/2012/01/keeseville-to-port-henry-ny.html, mountain bike routes, sea kayaking, snorkeling, wind surfing, sailing, and paddle board paid lessons and tours available on site. Huge golf course located a 4 minute drive from rental room. Ausable Chasm is 4 min drive away. Free taxi service available to golf, train, ferry, Living Goods Resurturant. FULL breakfast included. use of canoe, paddles and lifejackets included. Paid guiding and instruction for other water sports available on site. Breakfast included. NO smoking, NO pets, NO children under 20, NO hunting, NO fishing, children under 15 only if accompanied by a parent, NOTHING flushed down the toilets except for toilet paper and "the job" because we have a septic system. NO excessive alcohol consumption to the point of being a burden, danger or annoyance to anyone else.